Photo filters are everywhere on the internet. But do they really affect engagement? Yes. A lot. At least according to an interesting 2015 study from the team at Yahoo Labs and Georgia Tech called Why We Filter Our Photos and How It Impacts Engagement (PDF) which looked at the use of photo filters in the Flickr community. Given how popular Instagram, Facebook and Snapchat filters are, this is not surprising, but it is interesting to be able to put a quantitative value on these filters. Improving aesthetics: Smartphones have limited options to correct brightness, saturation, contrast and focus so filtering may improve the overall aesthetic. Adding vintage effects: Black and white and aged look are very popular to give photos a look and feel that is relevant but not immediately obvious in the full color version. A black and white filter, for instance, can be used to bring attention to a certain texture without being distracted by colors. Manipulating colors: Filters can help to either emphasize a certain color or reduce color diversity. Making the photos appear more fun and unique: Sometimes filters help users give a fun and unique look that the camera alone simply cannot achieve. It seems clear that in the social media era filtering photos has a huge impact not just on the success of a private Facebook page but also on businesses taking advantage of social networks like Instagram, Snapchat and Twitter. 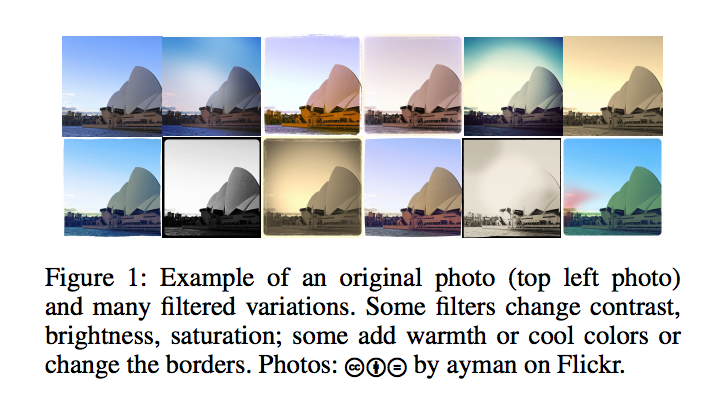 If you’re inspired by these findings, read on about how to use the Filestack API to programmatically add filters and borders to your photos. Filestack provides a bunch of filters that let you create Instagram-like photos programmatically. Let’s look at the Sepia option. tone: The value to set the sepia tone to. The value for this parameter can be any integer in a range from 0 to 100. The default value for this parameter is 80. Let’s start with this beautiful vineyard. Ahh, like being back in Italy in the 30s. 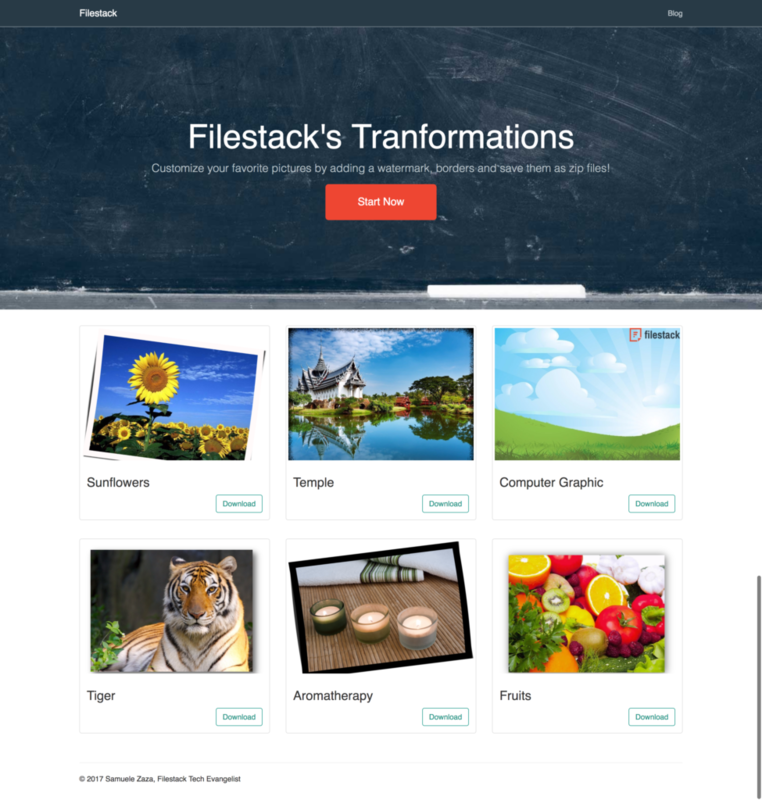 This just one of many transformations Filestack can do you for. You can do many other things such as blur, sharpen, or even add borders. A complete list of image transformations is available in our documentation. color: The frame color, you can use the word for a color or the hexadecimal representation. The default is snow. rotate: The rotation assumes a value between [0, 359], if not specified the rotation is random. background: The background color behind the polaroid instant picture. As the option color, you can use the word or the hex representation. The default is white. NB: Notice that I did not set the rotation so the value is a random value between 0 and 359.
spread: Set the spread of the tearing effect, the values can be between 1 to 10000. The default is [1, 10]. background: The color to display behind the torn edge, it can be either the word of a color or the hexadecimal representation. The default is white. blur: The blur for the shadow effect takes a value from 0 to 20, the default is 4.
opacity: The opacity level for the shadow effect. The value is between 0 and 100, the default is 60.
vector: the X/Y coordinates that determines the shadow position, the values are from -1000 to +1000, the default is [4,4]. color: The shadow color, as usual it can be either the word of a color or the hexadecimal representation. The default is Black. background:: The color to display behind the image, it can be either the word of a color or the hexadecimal representation. The default is white. And that’s pretty much all you need to know start editing your pictures with Filestack. Apply the 3 transformations to the image. Let’s kick off with the picture upload. This is where the Filestack API pick function comes in handy. With pick we have total control of the uploading process, including the type of files, file sizes, and sources. The transformation, which we’ll look at in more detail below, is just the piece of URL before the Filestack handle where the process API domain or CDN are included as well as the specific image transformations chosen in the form. 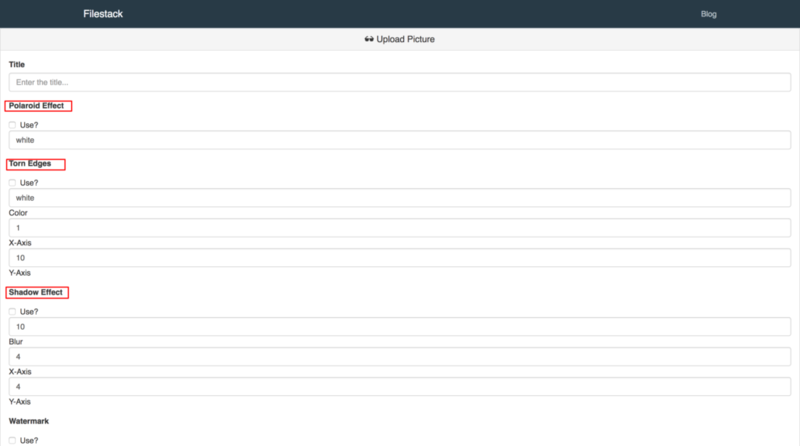 Now let’s run the project and browse the /add view where you can upload pictures and manipulate them. For instance, the shadow effects allows for blur and vector (defined by x-axis and y-axis). The effects and other transformations can be combined together, hence the string concatenation in the return line. I separated each transformation in a specific function for better clarity. By the way, if you noticed the getWatermark function, this app provides more transformations than the ones covered in the article. If you are interested in learning how to add watermarks with Filestack I wrote a tutorial about it on the blog. The 3 functions return the formatted piece of URL for the specific transformation by concatenating the values from the form inputs. That’s all, you are now able to use Filestack border and effects along with React to beautify your photos.